【Slip-resistant foam】Handles are covered by slip-resistant PVC foam, it is not only slip-resistant but takes much your hand sweat. Give you soft and comfortable exercise experience. 【Stable and safe】Adopting the 工-shaped ergonomical design, it is stable and safe, which can protect your hands from being injured during the exercise. 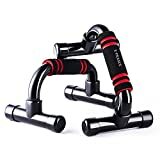 【Built your Muscles】This push-up bar can exercise your chest muscle, abdominal muscle biceps and your back muscles; Perfect for professional Gym and Home training. 【Easy to Assembly】 It is very easy and fast to assemble and disassemble for storage or travel. E-PRANCE push up bar let you exercise anytime, anywhere. stabilization of the core and lower body. are designed to get the very most out of your pushups. increase intensity and help with teh discomfort sometimes experienced with the exercise. with your palms flat on the floor. ※ Please make a scientific plan, choose the appropriate traninings methods and do not overturn the plan. ※ By adjusting the distance between both hands, you train with the device your muscle in shoulders, arms and back. ※ Please note the relaxation exercise after the workout with the support supports. ※ Please take note of the breathing when you use the push-up. ※ If the parts of the reclining handles are engaged, please stop the use.